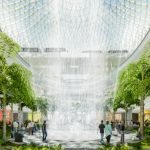 Jewel Changi Airport, the newest development at Singapore’s award-winning Changi Airport, will commence a phased opening in 2019. 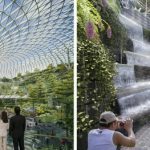 Jewel Changi Airport combines an intense marketplace and a paradise garden to create a new center – “the heart and soul” of Changi Airport. 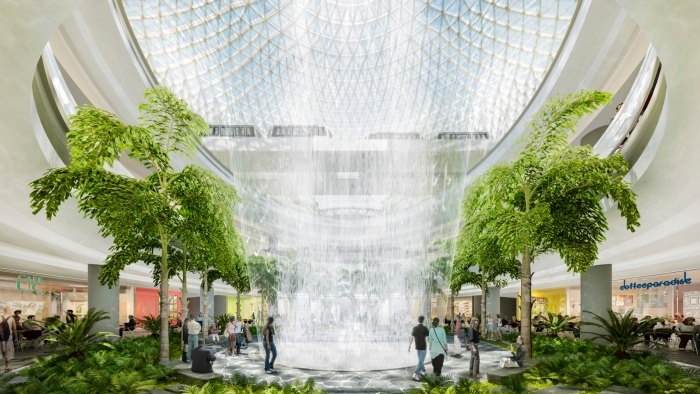 Once open, Jewel will establish a new paradigm for community-centric airport design, extending the airport’s principal function as a transit hub to create an interactive civic plaza and marketplace, combining landside airport operations with expansive indoor gardens and waterfall leisure facilities, retail, restaurants, and a hotel as well as other spaces for community activities. Linked to the city’s public transportation grid and with open access to Terminal 1, and to Terminal 2 and 3 via pedestrian bridges, Jewel engages both in-transit passengers as well as the public of Singapore. Entirely publicly accessible, the 134,000-square-meter (144,000 sq.ft.) 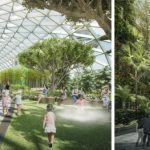 glass-enclosed toroidal building asserts a new model for airports as a destination for community activity, entertainment, and shopping. On the fifth level is the Canopy Park, which includes 14,000 sq.m. of attractions integrated within the garden spaces. The highly immersive features are designed to be both aesthetic and functional, providing pathways for traversing the space while delighting visitors with gorgeous sightlines, providing spaces for interaction and community building, and creating a sense of wonder and discovery.